Which Solar Panel Direction Will Give You The Most Energy In Australia? 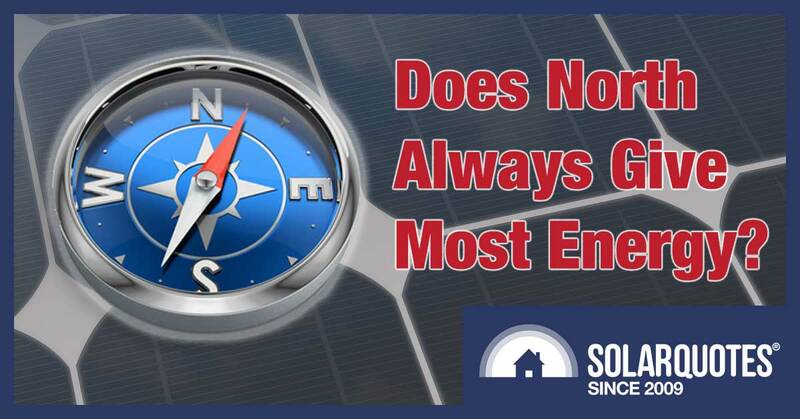 It is generally accepted the best direction to face solar panels to get the maximum possible output is directly north. While this is not a bad direction, it is often possible to get a very small boost by having them face slightly away from due north. Usually facing them a little to the east will improve output, but in some locations a small nudge to the west is best. Lower average temperature in the morning can cause solar panels to operate more efficiently than in the afternoon, giving those that face a little to the east a slight advantage. Average cloud cover can be consistently greater during certain times of day. This is often in the afternoon which gives a slight disadvantage to panels that face west, but in some places it can be the other way around. There are definitely good reasons for not facing solar panels in the direction of maximum possible output. A household can increase their self consumption of solar electricity by positioning panels so they’ll produce less energy overall, but more during periods when electricity use is high. Also, if feed-in tariffs based on either wholesale electricity prices or the time of day become popular — or compulsory — then maximizing the feed-in tariff received could make more economic sense for a household than maximizing total output. But maximizing output is often the best choice at the moment. 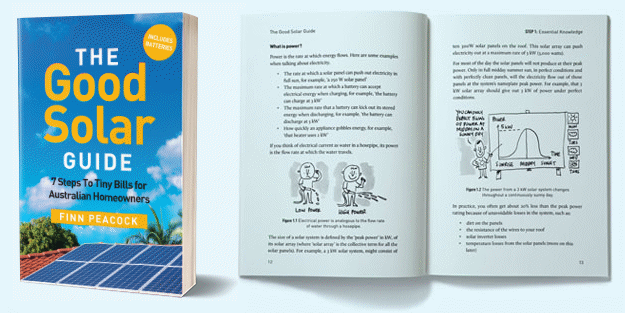 This is especially true for larger systems where the extra feed-in tariff received from the extra output will often outweigh any benefit from increasing solar self-consumption. It is also the best choice for the environment as the greater output will displace more fossil fuel generation. For this reason, if you’re not sure what’s the best direction to face your panels, I say go for maximum output. The direction in which panels will generate over 99.9% of maximum possible output. The range over which they will generate at least 99% of maximum possible output. The range over which they will generate at least 95%, 90%, and finally 85% of maximum possible output. I will be using the PVWatts site to determine these values. This means I run the risk of being incorrect if their Australian database is off or doesn’t run its calculations correctly in. But it is made by the United States’ National Renewable Energy Laboratory, who are a pretty canny lot, and I feel confident their results will be at least close to correct. I will also meticulously prepare highly informative and easy to understand graphics for you. Either that, or I’ll just dump the raw information on Finn and convince him to do it.2 Actually, that seems easiest now I think about it. The Optimal Direction For Maximum Output! While due north isn’t quite perfect, it turns out to be pretty close, as panels facing that way will produce at least 99% of their maximum possible output in every capital except Darwin, where it will be just below that amount. Darwin in the far north, where the sun is always high in the sky, offers the greatest flexibility in positioning panels for high output. Hobart in the far south is far worse, with output falling the fastest of all the capitals as panels are shifted away from their optimum position. In four capitals — Adelaide, Brisbane, Canberra, and Darwin — solar panels will generate at least 85% of the maximum when facing directly east or directly west while Melbourne just barely fails to make it into this group. Now I’ve worked out the best direction, along with reasonable directions, I may as well work out the worst direction for each capital. In a typical capital you can expect solar panels facing the worst direction to produce around 28% less energy than those facing the best. The standouts are Darwin with only a 17% reduction and Hobart where total output is reduced by 33%. Given the very rapid payback of north facing solar power, which is even better than when I wrote this article on it, south facing solar can definitely can definitely pay for itself for many households. So whether you have no choice because of the shape of your roof or because you want your roof to produce the most solar energy possible, south facing panels can be a viable option. One thing to note is south facing solar produces much more output in summer than winter. In Sydney, typical south facing solar panels will produce over 5 times more energy in December than June, while in Hobart the difference between those months will be more than 10 to 1. This means a household’s self consumption of solar energy from south facing panels is likely to be much less than from panels facing other directions, which is a consideration when deciding to install them. Unless you are building a new house then applying this theory is going to very difficult or near impossible on existing house that faces North. Would be better to make your Solar panels track and follow the sun. On this topic I found something really odd that I was not expecting. I have many panels on 3 sides of my house. In fact I swapped out 21 panels from North to South when I upgraded the North panels. In this summer past I found that the array on my South side produced higher peak production days than it did when the panels were on the North ( by 3 kWh ). For example the peak day for this array was nudging 34 kWh in mid summer 18 but in mid summer 19 it produced a number of days above 34 and up to 37kWh. Explain that please? I’m in Adelaide and there are no shade issues. Hmm, the peak days usually occurred on days under 35 deg anyway, usually the peak happens on a mild day the first or second of a streak of no cloud. The result must be related to the 12 degree angle, from North it was slightly East but South it’s slightly West? They should have been producing more in summer when they were facing north. I don’t really have any idea why they might be performing better now unless there was an issue that got fixed when they were moved. Yeah that’s why I was so surprised, it was meant to be better on North. I mean it was for total year production by a long way, just not peak day generation in a window of about 3-4 weeks in January, I have all the numbers that back it up. Good Article Ronald. I have built 2 systems on my properties in recent times: first off in Lismore, where the inverter is 10Kw, but output limited to 5Kw, with 3Kw of panels facing relatively East, on 15 deg pitch, & 10Kw on West side. That system performs well, with viable energy to fairly late in the day. (No figures because the inverter is not on the web yet, but it has averaged 40Kw/day for over 2 years. My other system is at home, where I recently replaced the system. Here, I am on 2 phase, so have 2 of 5Kw Solar Edge inverters, with Optimisers due to the shading) with 14.5Kw total panels. 8Kw facing North on 22 deg tilts (new panels on the old racking), then about 7Kw facing west on 15 deg tilt. The best output from this system was 85Kw/day, but the average so far is about 45Kw. (Only installed in November, so no full annual output). This system is restricted to 8Kw by voltage rise. So, what I am trying to point out is that there are other issues as well. I was surprised that the export limits do not greatly affect the system exports (in my case!). The peak generation is for such a short period, (say 3 hours) that the output is below the limit for most of the day. ´Overpowering´ the inverter is definitely worthwhile, but the rebate cuts out at 33 percent over. My latest system should pay for itself in less than 4 years. We put up an evacuated tube hot water system, if the woman in the office had bleated one more time is HAS to face north. I was going to ask True north or magnetic north? Of all tests I have done (in Victoria) I found West facing panels produced more output than East facing panels. I think it’s due to there being more fog/mist and other debris in the air in the mornings and by the afternoon it has all cleared. In he overall scheme of things, if the extra sunlight is so negligible when it comes to producing power, why bother about the position? When the cost of panels were so expensive then yes, it was wise to place them for any extra little output they might give – and this included the angle of degrees they were set at! No-one seems to worry to much about the angle any more – just slap them down on the roof! If output is of concern to you – now that panels are so affordable – simply install an extra panel. That’s a good point, Richard. If your panel capacity is above your inverter capacity you can avoid losing the small amount of energy loss clipping can cause. This loss is in general very minor, but the gain from perfectly positioning your panels can also be very minor. I’ve heard from an installer that it can be beneficial to have some panels facing west due to a higher FIT after 3pm. I could be wrong though! I have 2 sets of panels with 2 inverters. 20 panels facing east. 22 panels facing west. North side of my house could only accomodate 5 panels and south side is shaded by large trees. This setup suits my house as “ugly” panels can’t be seen from either the front or back of the house. It’s hard to notice they’re even there. I also have a 12kw battery. I don’t really care about the maximum output, as high temperatures “north facing” can reduce the efficiency of the panels altogether. I suggest to get a battery, as most people are at work during the day which is when they are working best. It’s much more efficient to store the suns power for use when the sun isn’t shining. If you really care about crummy feed in tariffs, then yes, put them in the best possible position. But if energy companies will pay me only 10c p/kw then I have to buy it back of them at 30c p/kw, I thought the cost of the battery justifies getting the panels in the first place. Get a battery and stop worrying about a 5-10% efficiency rates as the energy companies are just making money from the kilowatts you provide them. energy companies make 20c p/kw from the energy I supply them, I cut them off altogether and kept my solar energy stored in my battery for later use. They offer a set amount of kilowatts for usage per month/year. For a flat fee. $55 inc gst per month for 1041kw. That’s only if you use their battery. I’ve researched many companies services and this is by far the best value. This is an interesting idea… BUT I can do better. You need to orientate the panels into TWO groups, so that their production matches the peak power consumption times of the day. Now I do not mean literally or too the minute, but if peak power consumption is from say 8am to 10am and from 3pm to 6pm, then based on the demand, then if 40% of the power needed is at in the morning and 60% of the power is needed in the afternoon – then you split your panels into these two groups with 40% and 60% with the optimum orientation, respectively. The German example isn’t a bad one. There is a bit under 6 degrees (of separation 😉 ), seriously, Australia has more of its population closer to the Equator, where the Sun is (mostly) at its greatest intensity. So we can have a greater variation for panel alignment than Germany. The article uses true north and not magnetic north. Looking it up I see in Hobart magnetic north is 15.1 degrees (east) — the most easterly of all the capitals — but in Perth it is apparently 358.3 degrees (west). My son and I installed identical 5 kw systems just over a year ago in Melbourne. My panels all face True North. On my sons system due to the roof design half the panels face North-East (045 degrees T) and half face North-West (315 degrees T). My sons system produces very slightly more output (0.1-0.2 Kw) each day of the year than my system. In Summer both systems maximum production is 33.2 – 33.4 kw per day. Peak production is 4.1 kw. Paid for over 100% of my electricity useage over the past year, powering pool and solar heater pumps. Just had to pay daily connection costs. My sons system paid for 100% of useage and daily connection costs, no pool (he doesn’t need one, he uses ours :-)) Current Victorian feed-in tariff 9.9 c/kw hr.